We made a lot of progress in the girls’ room over the last few weeks, so here thought it was time for a quick update! Azelie was doing okay in a crib, but started trying to climb out and scream at bedtime. Considering she truly believes she is a pre-teen, we could tell she was ready for a big girl bed. Sharing a bunk bed with Zel is only Veronica’s biggest wish come true. Pretty sure that is what she envisioned the day her sister was born. This room was pepto bismal pink, and it almost hurt your brain after being in there too long. 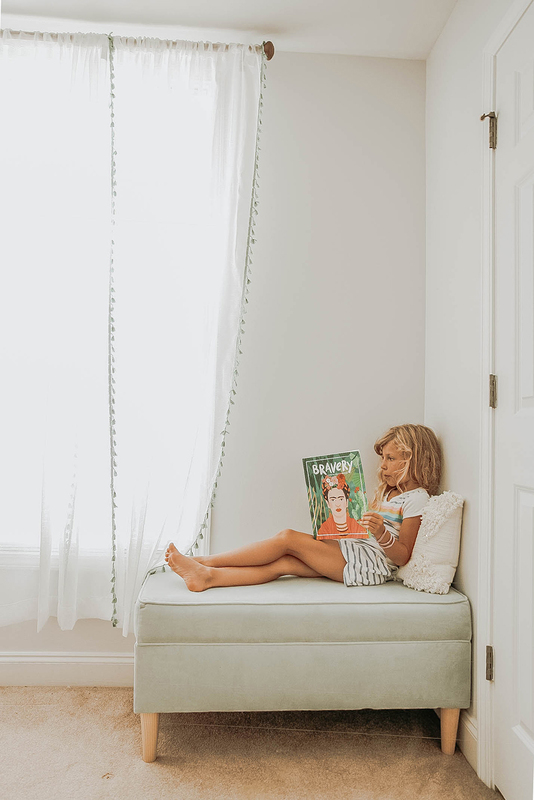 I kept putting this room off because I knew it would take some time to think through how to make a smaller room work for two girls. (Here is the original design board if you missed it.) I shared a room my whole life with my sister Maria, and stayed up way too late most nights. I really loved it. Except for that year in high school when I was discovering my creative side, and decided to break from my lifelong roomie to experiment designing my own colorful room. It lasted 6 months before I moved back in. Anyways.. 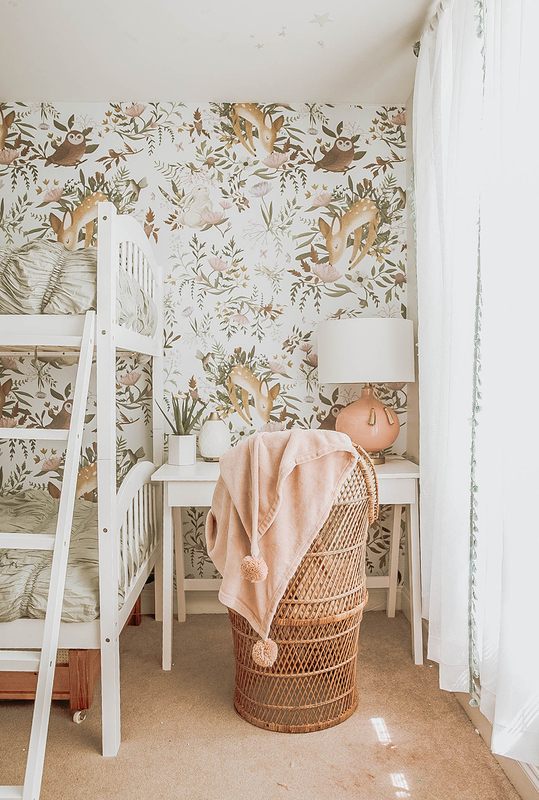 I worked with Anewall a few years ago, so it was fun to work with them again to incorporate their “Oh Deer” removable wallpaper mural. It was the first thing I pulled for the room, and I based the rest of the room design off of these tones. 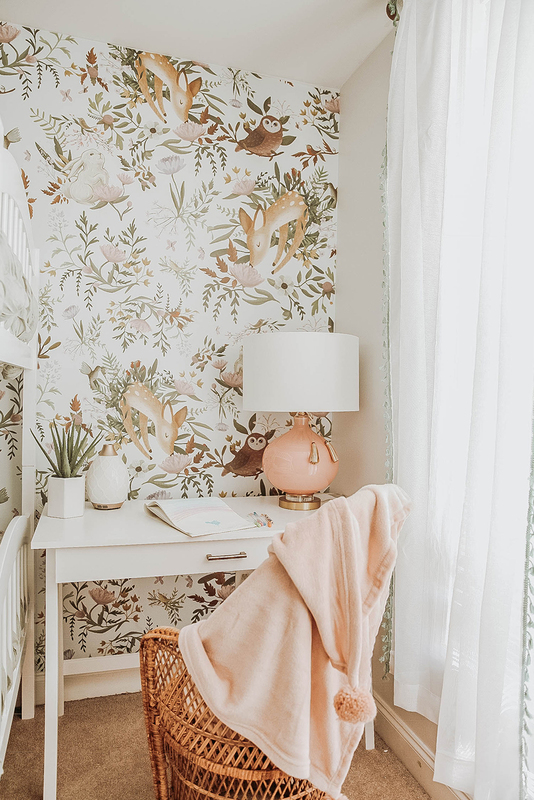 (Removable wallpaper how-to here.) I tested a few paint colors for the rest of the walls and settled on “Silver Frost” by Sherwin Williams. Gabe painted the walls + doors, and I will be finishing up the door trim. I am really digging the monochromatic looks, and I am even tempted to paint the ceiling! We were able to fit in a desk right beside the bunks, which Veronica can use for school work when she needs. I loved this affordable option and bubblegum pink lamp by Cupcakes and Cashmere. The pom throw is a ten dollar steal, and the chair was a flea market find. I browse facebook marketplace often, and see so many unique pieces on there! I worked with Lulu & Georgia to pull some kids furniture pieces from the room. Zel knew immediately that little chair was going to be her spot. Like a queen on her throne. 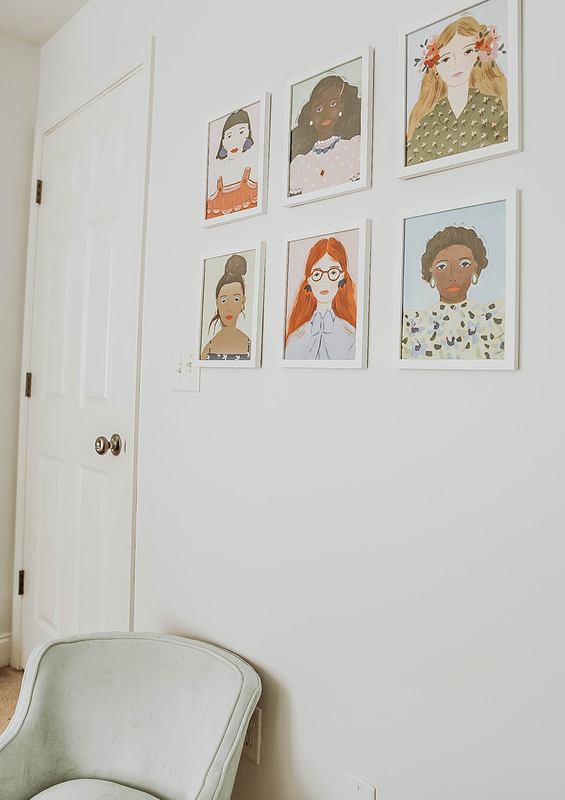 I found these beautiful Katy Smail illustrations in the recent issue of Darling, and decided to frame them into a series. The frames were $4 each from Target! Art doesn’t have to be pricey. The storage bench will help de-clutter the room, as well as provide a comfy reading nook. I love seeing how much they have already taken to the space. I didn’t think I could peel Veronica from her perpetual slumber party in the basement, but she requests time here now. She loves playing mini mom to Azelie. Azelie of course eats it up. I went with sheer tassel curtains in seafoam, although now I am wishing I went with the longer size! What do you all think? We will be adding bamboo blinds to the windows, a few more art prints, book shelving, and switching out the fan. All it will need after that is the rug! Looking forward to sharing the final result. I know the blog allows us to do projects quickly by working with different companies along the way. It would otherwise probably take me years to finish a room from top to bottom. Hopefully these projects can just provide you with thought starters and different ways you can work with a space! Love it! 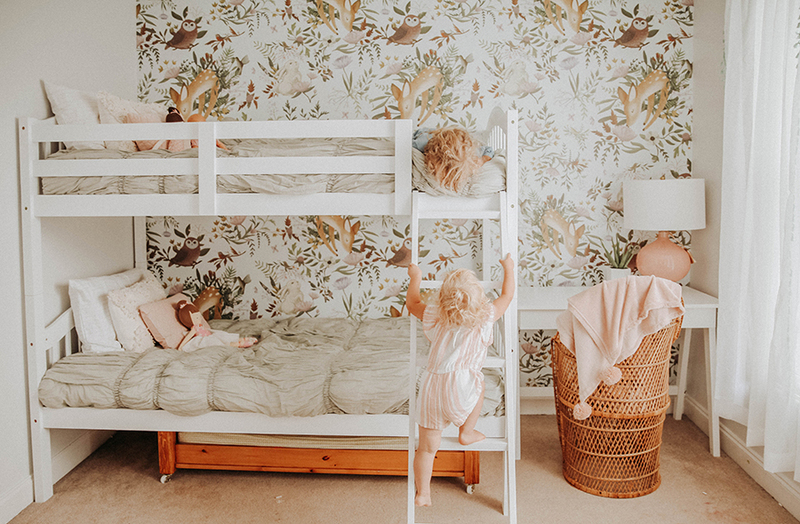 Our current nursery is teeny tiny & I was wondering how it would transition into an older child(s) room… Love the bunk idea & that they’re stylish too. yes, I actually love the challenge of styling a small space. Bunks are a great solution! I love that wall paper! It’s stunning! This wallpaper is incredible. You can get lost in it! I just love the name Jane! 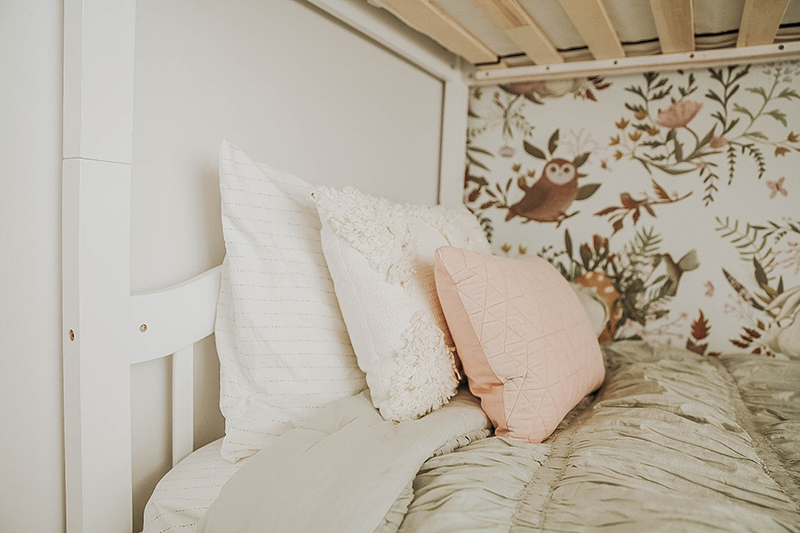 (Azelie’s middle name:)) Veronica has always shared a room with Gabriel which she loved, but she is beside her self to have such a girl space. ha! Incredible wallpaper design. I am just stuck to see. what an idea. it’s just like a haven. I save it for future plan. thanks a lot. Hi Cassie! These are twin size and perfect for these ages! HI! So cute – would love to know how small (dimensions) the room is and if you have a ceiling fan. I also have a very small room for my daughter and love your set up! Did you paint the wall with the door white? Is it a trundle bed under the bunk bed? Where is it from? Yes, I’d love to know as well! Thanks! Beautiful design! 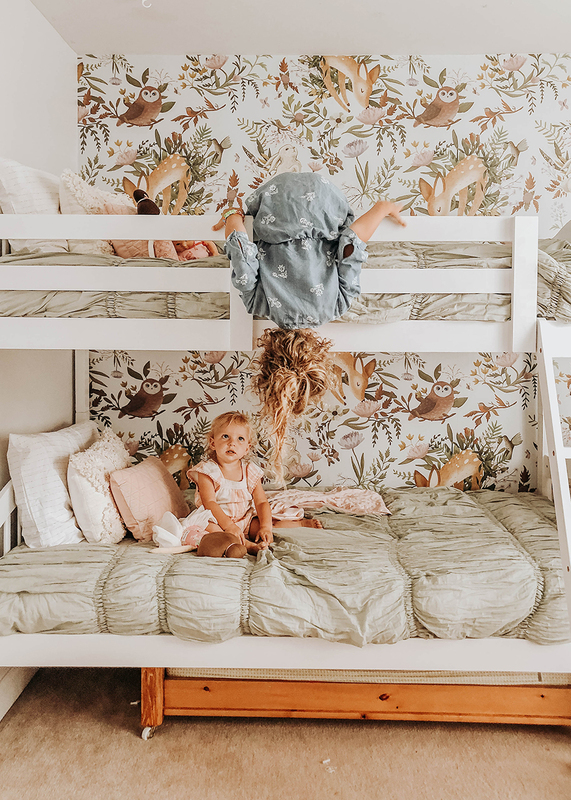 About to order these bunks and was wondering what mattresses you purchased for them..
Where did you get the green bedding?